You're doing what you can to create coaching clients. In fact, you probably have a client or two or even ten. But you don't have an actual system to generate a steady flow of qualified leads to your coaching practice and convert them into happy, high-paying clients. Maybe you just don't know where to find clients without spending a ton of money on ads, designing a complicated and costly marketing funnel, getting lost in the technology abyss or just wondering the streets offering complimentary sessions to everyone and their uncle. Perhaps leads aren't the issue for you. 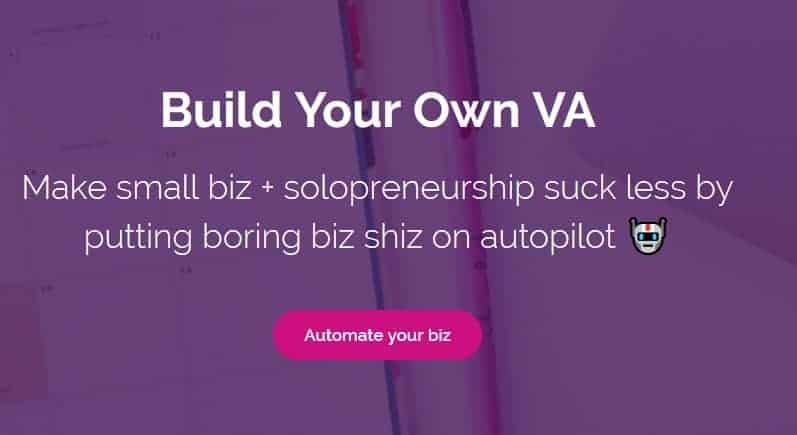 But the idea of selling your services makes you nauseous. You love coaching and you're good at it. But when it comes to sealing the deal, you act like a wiggly weirdo. Even your best enrollment sessions seem to fall apart at the end when it's time to ask for money to do what you do best. Hey! I'm Dallas Travers, founder of the Six Figure Coach Club and creator of Client Surge. I know how frustrating it can be when you want nothing more than a successful coaching practice but you're stuck in the stop-and-go guessing game of client attraction. Luckily (for us both), I've created a no-cost system to attract tons of qualified leads to your practice and convert those leads into incredible clients without be smarmy or pushing or slick. This system alone has generated 2.5 million dollars in revenue for me and now, I'm going to teach it to you. 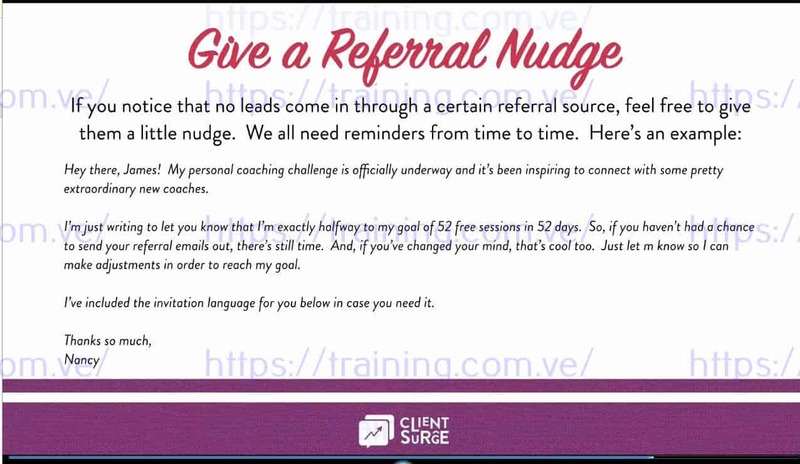 If you're a coach and you need a simple, repeatable, low-tech, no-cost system to consistently fill your coaching program or client roster, I hope you'll join me for an 8-week Client Surge adventure. If you want to create a steady flow of leads to fill your coaching programs, you need to be crystal clear about who your audience is, how you serve them, and what your packages and pricing look like. Without it, you'll always struggle to attract new clients and leverage word of mouth referrals. We’ll set you up for success with irresistable packages that speak to your clients biggest priorities and pricing that hits the sweet spot every time. Referrals are at the heart of the Client Surge System. This week, I’ll show you how I built a free and simple referral system that’s generated 2.5 million dollars in revenue to date. This system can work for you too whether you have a large community or a teeny-tiny one. You'll master my 13-Step Free Session Formula. It combines the perfect mixture of visioning, coaching, accountability and selling. You’ll feel confident about serving and comfortable selling so both you and the client leave the session excited to work together and clear about the next steps. You can let go of the pressure of a one-call close because the fortune truly is in the follow through. I’ll teach you how to create accountability in your initial enrollment sessions, how to powerfully serve each person with customized follow through, and how to convert the right prospects effortlessly. Now that you’ll have all of the moving pieces in place to collect referrals and convert them into clients, we’ll take a little breather and spend Week 5 addressing any burning questions or little fears you have before you hit GO on your own Client Surge System. Woo hoo! By now, you’ll have some new enrollment sessions scheduled, so I will walk you through the process I follow to gracefully onboard new clients. That way, you can focus on serving your new clients as an incredible coach and they’ll feel completely supported and totally jazzed about working with you. Sometimes people aren’t quite ready to take the leap and become a client right away. But a lot of coaches leave money on the table here because they assume the “let me think about it” client is lost forever. I’ll help you fill in the gaps and build rapport with those people who aren’t an immediate yes so you both don’t miss out on the chance to work together when the timing is right. You’ve done it! By now, you’ll have a ton of qualified leads on your calendar, some powerful enrollment sessions under your belt and *hopefully* new clients already on your roster. We’ll bring our Client Surge adventure to a close with one last Q+A session. That way, you’ll be able to rely on the Client Surge System to attract new clients whenever you need them. 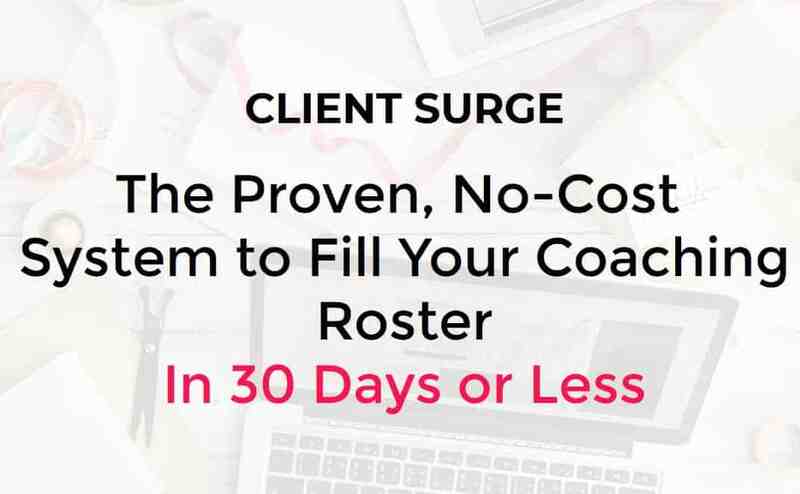 WHO: Client Surge is for you if you want a simpler way to fill your private coaching practice. The formula also applies to group coaching programs or any other offering that relies on enrollment sessions to fill it. WHERE: We'll meet as a group for 8 live Zoom webinar. Every Wednesday, I'll walk you through a new part of the Client Surge System. Then, we'll dive into Q+A and coaching to address your questions and overcome any obstacles that arise. WHEN: We'll meet on Wednesdays from May 9th to June 27th at 2:00pm Pacific / 5:00pm Eastern. If you can't make a live class, no sweat. All sessions will be recorded and I'll share the video, downloadable audio, and companion worksheets with you right away. We've had 28 applicants for our program in the last 4 days which is exactly 28 more than we had before we implemented Dallas' advice. Our sales call calendar filled up immediately and we've already closed 2 Pay in Fulls for our 12 month group program and 1 new private coaching client! We are 1,000% certain we would not be in this position if it wasn't for Dallas' guidance and hands-on help. The sales period is not even over yet, we're excited to keep going. "Thanks to Dallas’ incredibly simple and easy to implement system, my client roster AND each of my four coaches’ rosters are now full. I have a waitlist for our services and I couldn’t be happier. I would recommend Dallas to anyone who wants to take their business to the next level. I am continually impressed with her knowledge and her dedication to help each of her clients succeed. 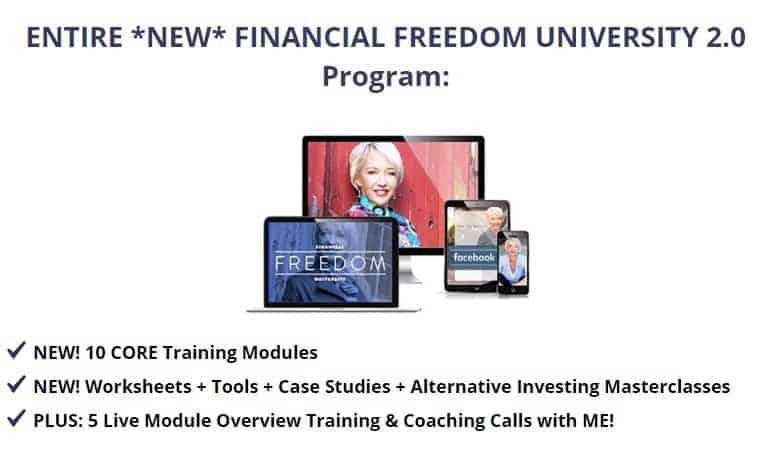 "I filled my group coaching program so quickly that I launched and filled a second one earning $57,789 in 90 days. Just one question Dallas encouraged me to share at the beginning of my enrollment calls changed everything for me and for my clients. Now, I look forward to jumping on the phone with potential clients because I know how to serve the client AND sell with ease and grace." The Client Surge Follow Through Funnel so you never let leads fall through the cracks again. My Magic Referral Remedy. This simple system earns me multiple six-figures each year. My signature Free Session Formula: 13 Steps to Connect + Convert. Eight Weekly group classes where you'll learn a new phase of the client surge system and receive coaching directly from Yours Truly. Lifetime access to every session's video recording, audio download and companion tools and templates. Extraordinary opportunity to experience Client Surge live before it becomes a self-guided course. READY FOR A CLIENT SURGE? Class begins on May 9th but enrollment closes on April 27th. Grab your spot now for this live, interactive, online course designed to fill you coaching program or client roster in 30 days or less. How Do I Know If Client Surge Is Right For Me? If you can say YES to any of the points below, I'd say that you're qualified to dive into Client Surge and get a ton of value from it. You feel pretty clear about who your ideal client is and how you serve them. Now, you just need to know how to find those elusive dream clients so you can get to work changing lives. You have a group coaching program that's becoming more and more difficult to fill. Your old strategies aren't working like they used to and you need a new game plan that won't cost an arm and a leg. You're ready to ramp up your business with a full client roster but you don't have a budget for advertising and technology overwhelms you. You've got big plans to create and launch a program, but you can't focus on that until your private practice is in place. You believe in the power of enrollment sessions as a solid way to create clients. You just need more training on how to connect powerfully and convert with confidence. You're willling to bring an open heart, a curious mind, and an extraordinary work ethic to put this system into action and finally create the client surge you deserve.